This two-floor log house located in Vuokatti ski centre was completed in 2002. 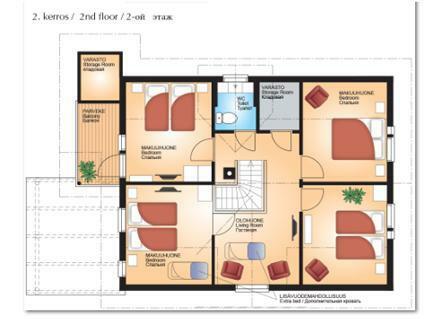 Floor area 127 m². On the ground floor there is combined kitchen, living room with sofa-bed and dining table max 10 pers. Sauna (electric heating), washroom, household room and toilet. 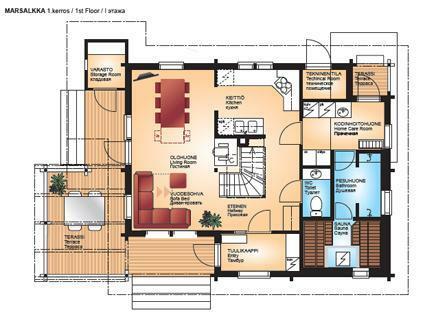 Upstairs there is four bedrooms (one with twin bed, other with separate bes), lounge, toilet and balcony. Extra: Internet Access. 4 x tv. Lockable ski storage. 2 x extra beds are mattresses. Kajaani 33 km, Sotkamo 7 km. Vuokatti ski slope 140 m, cross country track 100 m. Small lake 1,5 km. No pets allowed. Rating given by customers 4.4. Based on 6 reviews.